I provide online coaching and locally in person, using messaging, video calls and email. I can provide feedback and assessments on swim form, running and cycling technique. I have a philosophy of incorporating lifecoaching, nutrition and strength training as part of our training programs. I can provide one- time training programs or monthly periodized training Using the heart rate training methods. I’ve been running and doing triathlons for over 25 years, with 8 yrs experience at Ironman and 70.3 distances. I have been coaching runners and triathletes for over 5 years. I have a love of the sharing in the journey and watching my athletes get stronger in body, spirit & mind. 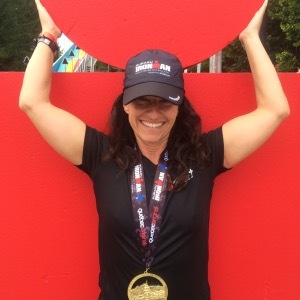 I approach training with a mindful approach In order to work on mental and physical strength and it’s barriers.As a Certified Ironman Coach, I believe in communication, smart training and balance with your lifestyle. Success. Coach Kelly Hill has been notified of your message.